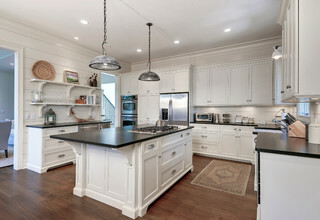 Robert Paige Cabinetry designs, builds and installs truly custom residential kitchen and bathroom cabinetry. We serve the greater Charleston area from downtown to Kiawah Island. Over the past 15+ years, we have gathered some of the Lowcountry’s finest craftsmen who build one of a kind cabinets. Robert Paige has been the owner since 2006 when he purchased the business from K&K Custom Cabinets, where he had worked since 2001. Prior to coming to Charleston, Robert worked and trained under the renowned furniture maker Jim Litloff in Atlanta, Georgia.